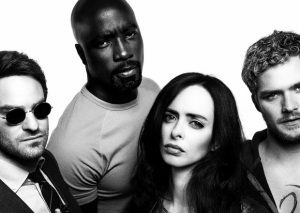 The new Netflix original series, The Defenders, is the streaming service’s sixth collaboration with Marvel TV and unites the central characters of five previous seasons. Kyle connects the comic book origins of the superhero team up to the forming of the first Defenders. Claire discusses the career of show runner, Marco Ramirez, and why Disney’s new streaming service won’t stop Netflix from making more Marvel shows. Our hosts conclude with their thoughts on the show’s script, its stage combat, and which hero is their favorite. Previous 51b: Beowulf – Vikings, Monsters, and Image Comics	Next 53: The Nameless City – A Mongol Invasion for Kids!